In this course, Prof. Steve Weissman gives 15 video lectures on Energy Regulations and the Environment. This course introduces students to the legal, economic, and structural issues that both shape our energy practices and provide opportunities to overcome these critical problems. The course focuses primarily on the regulation and design of electricity systems and markets, since so many energy choices—the use of oil, natural gas, coal, nuclear, the green alternatives such as solar, wind, and energy conservation or “demand side management”— relate to the way we generate or deliver electricity, or avoid the need to do so. 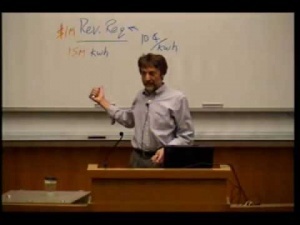 Prof. Steve Weissman in Lecture 15: Course Review.